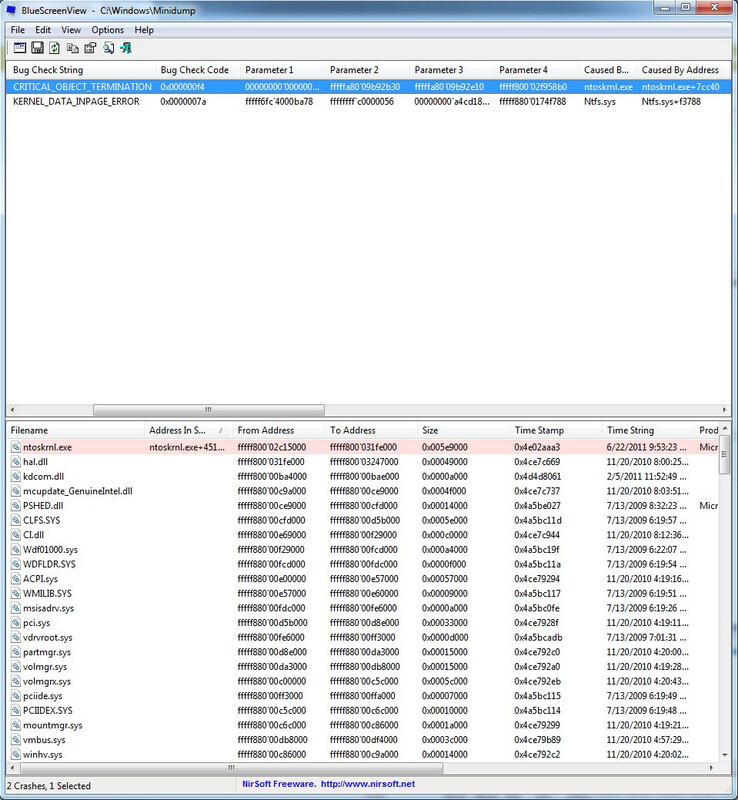 I've attached a screenshot, which shows that ntoskrnl.exe (a frequent cause, not shown in BSV) and ntfs.sys are causes for this BSOD. Settings I've changed in the BIOS are changing the SATA mode to AHCI from IDE, enabling hard drive S.M.A.R.T. capabilities and changing the primary graphics adapter to PCI Express. However, I'm still getting these BSODs and can't figure out the issue. Right before a BSOD, everything slowly freezes up, programs become non-responsive and some problems close spontaneously. What do these BSODs mean and what do I do to prevent them from happening? Check for MB bios updates and see what issues are resolved. Update the BIOS if needed. Return the bios settings to their default. Just in case. Check for updates for your SSD firmware. Apply them. Check that all PSU connectors, Video card, RAM sticks, sata connectors,coolers etc are properly plugged mounted and secured. Run memtest86+ for a couple of hours to make sure your ram is working ok.
Run Intel Burn Test a few times on very high. If it passes 5-10 tests, your CPU is stable. Monitor your cpu temp. If it passes 70 Celsius this can be the problem. Run Prime 95 on 3 threads and Kombustor for maximum power load. Check the temperatures of your CPU and GPU under load. If they are high - this may be the reason. If your system passes the above the chances are that your hardware works fine and you don't have a faulty specimen for some of the components. Return windows to clean install. Then you move to disable all features in bios that can introduce instability cpu sleep states etc. I wonder if everything is seated correctly on your motherboard. If there's an occasional misconnection, you could easily get BSODs. Last time I had a machine that was BSODing, a simple re-seating of the RAM sticks resolved it completely. I no longer have these parts, but the motherboard was defective and ended up dying. Not the answer you're looking for? Browse other questions tagged windows-7 bios bsod or ask your own question. Does updating BIOS solve certain BSODs?